Do you want to go to the world famous Mustafa Centre, Singapore? This article will describe step-by-step how to get to the Mustafa Centre by MRT. Accompanying this video will also be a YouTube video I made about how to get the Mustafa Centre. Mustafa Centre is in Little India, Singapore, and is a HUGE shopping centre. Additionally, it is one of the few 24 hour shopping malls in Singapore. Now, a step-by-step guide will follow about how to get to the Mustafa Centre from the Farrer Park MRT Station. Farrer Park MTR station is on the North East Line (purple line) next to the Little India MRT station. 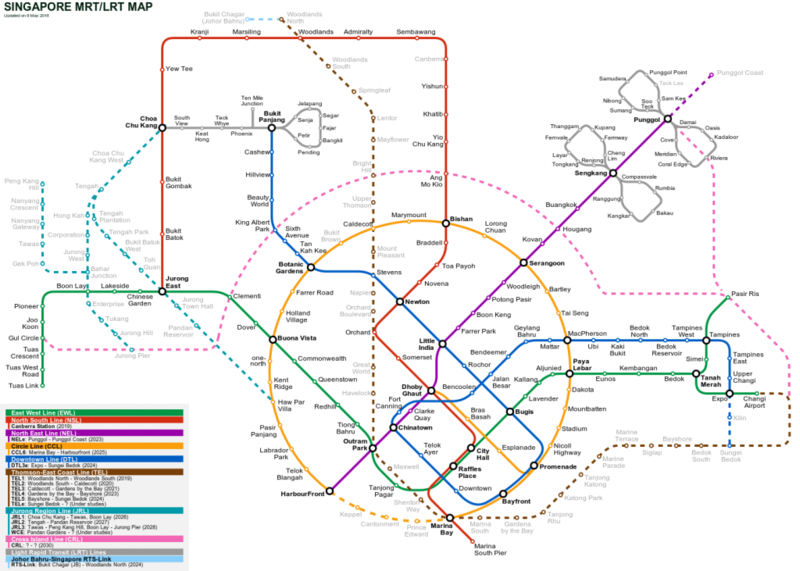 Singapore MRT and LRT Map. Image via Wikipedia. Once you get to Farrer Park MRT station, there will be 2 ways to leave from the trains. Go towards the side which is has exits C-F.
Farrer Park MRT. The with exits C-F. There should be many signs posted in the station about the various exits. Follow the signs towards exit F. Once you leave exit F, it will look like below. Walking down Roberts Lane towards Serangoon Road. You will walk to the end of the road, which will then intersect with Serangoon Road. Then, turn left on Serangoon Road (note you might not see a sign labeling Serangoon Road. Just know that the main road intersecting Roberts Lane is Serangoon Road). Next, turn left on Serangoon Road, and walk along the road for a short time. Walking along Serangoon Road towards Syed Alwi Road. You shouldn’t have to walk for very long along Serangoon road. Syed Alwi Road should be the first road you see across the street. Actually, it probably shouldn’t be more than 2 minutes of walking. Cross the road and turn right on Syed Alwi Road. Once you turn right on Syed Alwi Road, you should see Mustafa Centre. Probably, you could walk here within 2 minutes after you are on Syed Alwi Road. Mustafa Centre is amazing. Below is a picture I took in front of Mustafa Centre. Me in front of Mustafa Centre. Below you can also watch a video I made for How To Get To Mustafa Centre.